Is Coconut Milk Okay For Baby? Question: I breastfeed my 7-month-old and she absolutely loves all healthy organic food including salmon. My question is I don’t produce enough milk to pump for the odd occasion Daddy has to look after her. She is compound MTHFR and wants to know the best formula for her to have on that odd occasion as they all seem to have folic acid in them which is obviously not good for her. Can she have organic coconut milk every now and then instead? Answer: Fortunately, your baby loves solid food, which means you can deliver more nutrition by solids than by formula at this stage. The most nutrient-dense solids are wild salmon, avocado, sweet potato, and egg yolk. Since you only need a supplemental feeding on the “odd occasion”, Daddy can feed the baby solids and use organic coconut milk if she wants something to drink besides water. 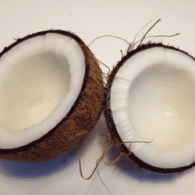 If you want to boost the fat calories in the coconut milk, you could add some coconut oil. For those who don’t know, MTHFR is an enzyme that helps our bodies use folate in our metabolism. Many Americans have a mutation in the gene that makes this enzyme, and such people won’t utilize folate/folic acid properly at the cellular level. This can theoretically increase the risk of a variety of health problems. However, research isn’t conclusive as to whether or not people really are harmed by this mutation. It’s likely that some may be, but many may not. It can also depend on the degree of mutation, as some people have more severe MTHFR gene mutations than others. Your doctor can order this gene test for you, or you can order a do-it-yourself kit online. Most health experts agree that supplementing with methyl-folate instead of regular folate gives those with the gene mutation the type of folate their cells can use. Overall, the research on this to too preliminary to know exactly what to do about MTHFR. But it’s possible supplementing with methyl-folate is the answer to this growing problem. Ask your doctor about dosing.